Surfaces that appear level can be just as dangerous as stairways - perhaps even more so, as less care seems to be required. Poor lighting, cracked or uneven paving or concrete, and the presence of water, oils or other liquids can seriously aggravate the risk of trips and falls that result in physical harm and lost time. When new, chequerplate offers reasonable slip protection, however, the edges wear rapidly creating a deceptively slippery surface. 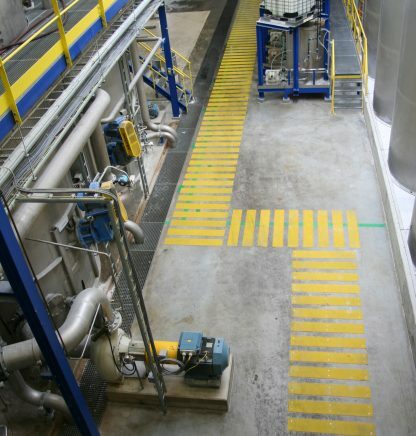 Where straight walkways exist such as beside conveyors, the metal deck can be spaced up to 150mm between sheets so that either heel or toe contact is achieved. 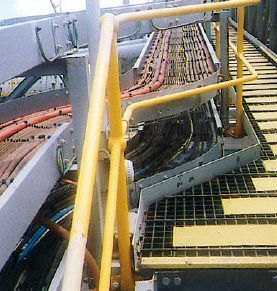 This allows spillage to pass through the grating walkway and offers considerable cost savings whilst eliminating any chance of slips occurring. 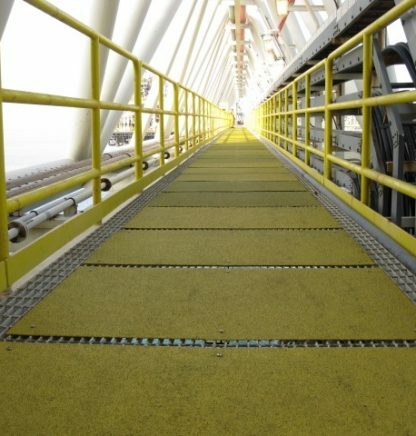 Vigil Antislip Metal Deck is measured in two dimensions; length ways (A) and width (B). A: Length of Metal Deck: There are two standard lengths; 600mm and 200mm. 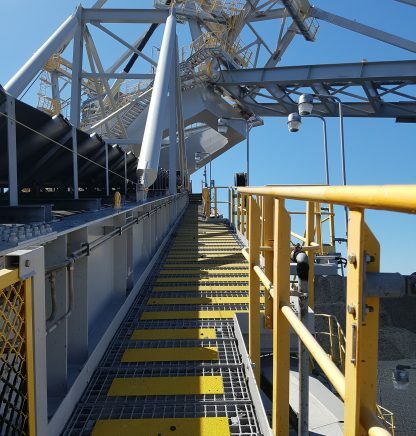 When laid, each sheet of Metal Deck can be spaced up to 150mm from the next sheet because on a straight walkway it is only necessary for personnel to achieve either heel or toe contact with Vigil Antislip to avoid accidents. By using 200mm sheets, there is less antislip required per square metre, however, there are more fasteners required so installation costs will be greater than if 600mm sheets were being installed. B: Width of Metal Deck: As with Stair Nosings, Metal Deck need not cover the whole width of the walkway or ramp. Personnel tend to walk within 100mm from the edges of walkways so it is recommended that Metal Deck 150mm – 300mm narrower than the overall walkway be ordered, ie. if ordering Metal Deck for a 800mm wide walkway, 600mm wide Metal Deck will provide ample protection. If there is omni-directional traffic, it is suggested that the Metal Deck is butted up against each other, to avoid slips between spaced sheets The situation is similar with landings where there is turning traffic. Many offshore companies are now purchasing Deck Mark which is Metal Deck with permanent writing and/or symbols on the surface. Apart from eliminating the chance of slips on escape route walkways during an emergency, Deck Mark points personnel to the nearest escape path. This works very well because when running, personnel are watching their footing, not looking above eye level for signs. 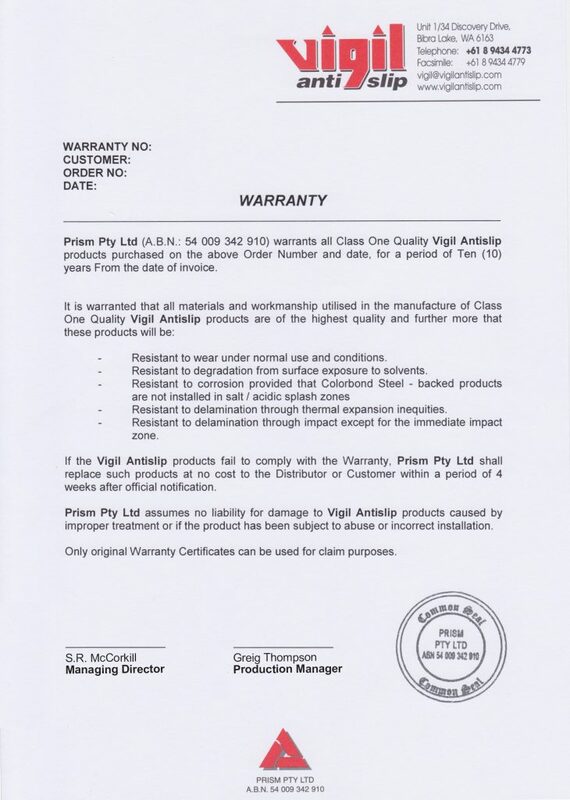 To remove the risk from buyers of purchasing inferior quality antislip products, a warranty period of 10 years should apply. It should also be a reasonable warrant; with few exceptions and the promise of replacement of inferior products. 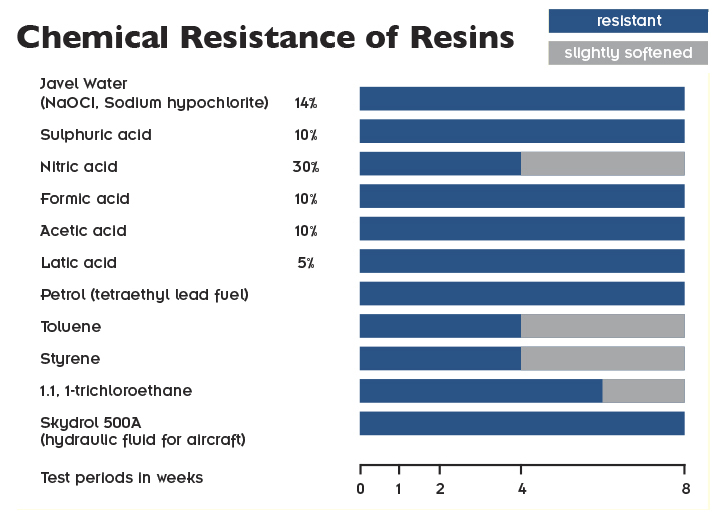 Vigil Antislip products are warranted against delamination, chemical attack, wear and corrosion when in normal use for a period of 10 years.